Hugo Barron Sierra's Wave Good Bye Baby, under jockey Alejandro Luna, winning the Dash For Speed Stakes at Arapahoe Park. AUROA, CO�MAY 26, 2013�Wave Good Bye Baby did just that as jockey Alejandro Luna hand rode the gelding to a three-quarter length victory in the $15,000 Dash For Speed Stakes at Arapahoe Park. 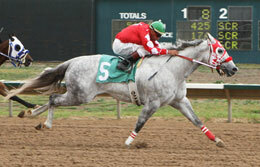 Jose Manuel Barron saddled the WAVE CARVER 4-year-old to his sixth career win for owner/breeder Hugo Barron Sierra. It was the first stakes win for the multiple stakes-placed gelding who completed the 330 yards in :16.768 seconds, a 94 speed index on the fast track. The $9,000 winner's purse boosted Wave Good Bye Baby's career total to $97,402. The Colorado-bred is from the Streakin La Jolla mare Baby La Jolla. Essohess picked up $3,000 for his second place effort for owner Juvenal Sanchez. Alejandro Chavez conditions the Bielau Oaks Texas-bred son of champion Ocean Runaway, a full-brother to world champion WAVE CARVER. Vince Guerra had the riding call on the bay out Dianetogetcha, by Mr Eye Opener. The three-time winner has earned $35,898. Jose Chavez' Furious Styles finished half-a-length back to earn $1,500 for third. Zachary Quezada trains with Raul Ramirez, Jr. riding. Becklyn Farm bred the 8-year-old in Texas . Completing the field were Prince On Line and Wcr Really On A Run. Patriots Glory and This Is Da One were both scratched.